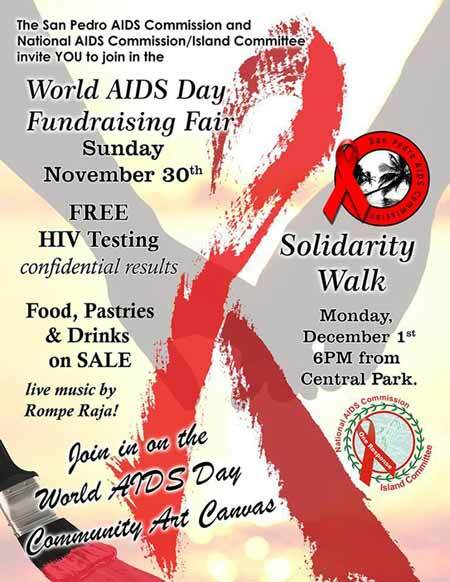 The San Pedro AIDS Commission and National AIDS Commission/Island Committee invite you to join in the World AIDS Day Fundraiser Fair Sunday November 30, 2014. Free HIV Testing will be available. Food, pastries and drinks will be on sale along with live music by Rompe Raja. Join in on the World Aids Day Community Art Canvas. The Solidarity Walk will take place Monday December 1, 2014 at the 6pm from the Central Park.